I finally stepped into 2011 (well almost 2012!) by getting a smart phone. For years I had a regular, ordinary cell phone. Yes, I got teased on a consistent basis. I work in an industry where I need to be readily accessible to my phone and email. I decided to get an iPhone 4S. Of course when you get a new phone, you have to accessorize it, right? DomeSkin is specially designed to protect your device while allowing you to personalize it with your own unique custom style. DomeSkin products can be easily removed from the device and come off totally clean thanks to the patented 3M technology used in the construction. Unlike thin vinyl based skins, DomeSkin products are reusable and they provide an additional 3D layer of protection. The clear dome design not only offers a customizable stylish 3D look for your device, it also inhibits slipping and allows better gripping of the device. 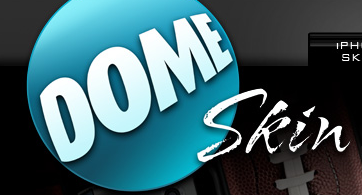 DomeSkin products are scratch-resistant and much more durable than other thin vinyl skin products. DomeSkin offers skins for the iPhone, iPod, iPad, and any version of the Blackberry. The designs come in a range of patterns, colors, and styles. I like that DomeSkin offers such a variety to choose from. There is definitely something for anyone. Whether you like polka dots, sports, abstract, zebra print, or flowers, they have you covered and more. I've had cases for my phone before that were impossible to get off. They practically became attached to the phone and it was really annoying. I knew that I didn't want to have that issue again. When I had the chance to review some iPhone skins, I was excited. I took my time browsing the pages. I finally settled on zebra pink and fluer de lys. These two styles instantly stuck out to me. The patterns are bright, bubbly, and fun. The colors are really vivid too. I also really like how they have a 3D look. I like my phone cases to reflect my taste. The skins were very easy to put on and I had no issues at all. The packaging has the front and back skin inside. They are not connected. First you put on the front skin, then the back one. I have the pink zebra skin on my phone right now. I really love it! The skins are sticky and adhere well to your device, not to mention that they are high quality too. The skin is thicker than most skins, but it still maintains a slim look to the phone, which is impressive. The skin does protect the phone somewhat too. I like that the skin does not obstruct the side controls of my iPhone, like some cases sometimes do. Another good feature of the product is that the skin is reusable. If you decide you want to give your phone a makeover, it's not a problem. It comes off easily and clean, leaving no residue or material behind. The skin is scratch-proof. Do you sometimes place your electronic devices down hard on a table or desk? Or do you let your phone rattle around in your purse? No worries, your phone will be protected and the case will be scratch-free. The only issue I have with this case is that the skin sometimes sticks to objects. It's not a huge downfall, it's just something to get used to. If it does stick to something, it's easy to remove. Overall, I'm really happy with these cases and my iPhone looks great in them! Anything from DomeSkin would make the perfect gift for that tech-junkie in your life. 1. I will be picking ONE (1) winner for this contest. One winner will win a product of their choice from DomeSkin. I prefer the Fluer De Lys design. Please accept my entry. Thank you. I love fluer de lys..
Oh there are so many to choose from! I'd go with the Bamboo Checkers for iPhone4! Christina - xristya@rock.com - I'd choose Fleur de lys! I love the Fluer De Lys for the blackberry pearl. I'd choose the Punk Rock Pink skin for IPOD TOUCH 4TH GEN for my daughters new Ipod Touch.